The use of physical barriers can broaden the scope of service for forward-thinking PCOs. Figure 1. Trench installation of particle barrier. Figure 2. Wood samples wrapped in membrane remained undamaged by termites for the five-year experiment, while unprotected wood was completely destroyed. A MEMBRANE BARRIER. Another new material that can broaden the scope of service for pest control professionals is a membrane barrier. Membrane barriers are elastomeric, meaning they move when the structure moves without tearing, and are available in a caulk tube or adhered to a high-strength backing. Texas A&M University began testing on sealant barriers in February 2000 and continues to help improve them to this day. A field study was initiated in 2003 to evaluate the effectiveness of these elastomeric membrane barriers to protect wood against termite damage. Aged Southern Yellow Pine (SYP) boards were cut into billets. The treatment billets were completely covered and sealed with membrane barrier, which is self-adhering, while the untreated control billets were not covered with treatment materials. Sets of treated and untreated control billets were buried together in five different Texas locations with demonstrated subterranean termite activity. A total of 10 billets, 5 treated and 5 untreated controls, were buried on the same date and location. The protocol called for exhuming and removing one each of the treated and untreated billets, from each site on or about the annual anniversary date. The test units were to be taken back to the laboratory, carefully washed to remove soil and termite mud tubes, air dried, and then the amount of damage done to them by termites or other factors was estimated. Each of the extracted billets were visually inspected and the damage was rated using the ASTM scales (D3345-08), in which a rating of 10.0 meant “no damage” was observed, while a rating of 0.0 indicates the wood sample was “destroyed.” Four samples of wood that were left untreated were completely destroyed by year 2 and the fifth sample was destroyed by year 5. 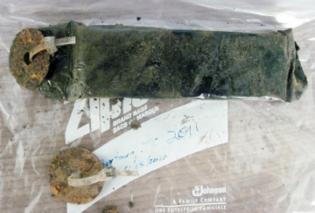 Alternatively, samples that were wrapped in membrane barrier were rated at a 10.0, or undamaged, throughout the five-year field experiment. 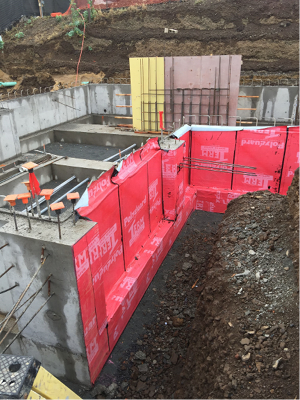 Membrane barriers are adhered to high-strength backings and are used to protect the below grade foundation. This material also operates as the waterproofing or vapor barrier, covers 100% of horizontal surface (penetrations, joints, and future cracks) above the slab, and seals all vertical seams, crevices and cracks. Additionally, membrane barriers have been adapted into a caulk sealant formulation that can be used to protect vulnerable intersections between pipe penetrations and the foundation that can be avenues for termite intrusion. When caulked around the plumbing penetration, sealant barriers adhere to the pipe (PVC, copper or others), and to the concrete. 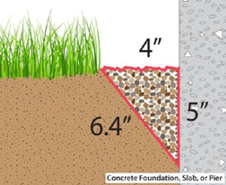 As the structure moves during settling or due to expansive soils, the sealant barrier material maintains a barrier that is impenetrable by termites and other urban pests. Figure 3. Membrane barrier designed for termite exclusion is installed on a below-grade concrete foundation in Hawaii. SCREEN THEM OUT. Screens with apertures small enough to block termites were developed in Australia and have been widely used in the United States, mostly for plumbing penetrations, since the 1990s. One of the early uses of screens for pest exclusion was the implementation of screen doors and window coverings in the 1860s. Screen used to mill grain were repurposed to cover windows to keep pathogen vectors, such as mosquitos, from entering homes. Today, building codes require insect screens at vent openings, but entomologists know that smaller ones are often needed. Most insects can be excluded with screens measuring 1/16 inch (1.59 millimeter) in aperture size, but to effectively exclude termites, required screen apertures measure 1/55 inch (0.46 millimeter). Application areas for screens in the building envelope include weep holes, soffits, gable and ridge vents, among others. The building envelope is a physical barrier between the interior and exterior of a structure that has been proven to keep energy in and environmental elements out. Each of these materials are upgrades to the building envelope that have shown to keep termites and other pests out. The goal of these types of materials is to build out pests with sustainable systems and exclude pests for the life of the structure. Each of the pest exclusion materials discussed herein are free of pesticides and are classified as “devices” or barriers by regulators. Integrated pest management tactics employ the use of physical and mechanical barriers to control pests, along with chemical, biological and cultural, or sanitation, methods. In addition, federal and state governments emphasize sustainable systems as part of sound and effective IPM programs. An example of such initiative would be NPMA’s QualityPro Certification Program, a service option and certification developed by the National Pest Management Association that is awarded to companies that provide service options that are least-risk to people, property and the environment. Figure 4. Membrane barrier may be installed as part of a bath trap barrier, along with screen and particle barrier, to exclude termites and other pests at concrete leave-outs. SUSTAINABLE SOLUTIONS. Our goal as pest control professionals is to protect the health and property of our clients. We know that pesticides are effective for months to years, but buildings are built to last for decades. Termiticides are often reapplied during the life of the structure to protect against foraging termites. It’s important, as an urban pest management professional, to explore the use of proven non-chemical approaches such as mechanical and physical barriers to supplement pesticide use. Sustainable approaches to IPM are part of the future for professional pest management. Through the use of aggregate barriers, elastomeric sealants and screens, we can solve difficult problems with pest incursions. Sustainable technologies such as these are excellent opportunities for add-on services. Resistance to chemical-only approaches and early adoption of physical barriers can put a pest control company ahead of the curve. 1Ebeling, W.J. and R.J. Pence. 1957. Relation of particle size to the penetration of subterranean termites through barriers of sand and cinders. J. Econ. Entomol. 50: 690-692. 2Su, N.-Y., R.H. Scheffrahn, and P.M. Ban. 1991. Uniform size particle barrier: a physical exclusion device against subterranean termites (Isoptera: Rhinotermitidae). J. Econ. Entomol. 84: 912-916. 3Su, N.-Y. and R.H. Scheffrahn. 1992. Penetration of sized-particle barriers by field populations of subterranean termites (Isoptera: Rhinotermitidae). J. Econ. Entomol. 85: 2275-2278. 4T. Chris Keefer, Dan G. Zollinger, and Roger E. Gold. 2013. Evaluation of aggregate particles as a physical barrier to prevent subterranean termite incursion into structures. Southwest. Entomol. 38: 447–464. 5Yates, J.R., J.K. Grace, and J.N. Reinhardt. 2003. Installation guidelines for the Basaltic Termite Barrier: a particle barrier to Formosan subterranean termites (Summary). Sociobiology 41: 113-114. Krejci is lead research & technical sales associate for Polyguard Products’ TERM Barrier Division. Gold is former professor and endowed chair for Urban and Structural Entomology at Texas A&M University.